Starting your business in VoIP termination in Argentina, it is important to choose start plans with favorable conditions for prepaid subscribers. For these purposes, you can use not only the SIM cards of the key GSM operators in the country but also of virtual ones (MVNO). In Argentina, there are only two of them - Nuestro and Tuenti Movil. and they transfer a lot of voice traffic using the infrastructure of the country's largest mobile operators. Nuestro is the very first virtual mobile operator in Argentina. It utilizes the infrastructure Personal to provide its services. Its SIM cards are sold in branded retail outlets but can also be found on the black market. The cards can be sold to foreigners without any problems. The second local MVNO is Tuenti Movil (previously called Quam). It is a subsidiary of Telefonica and the largest virtual operator in Argentina using the Movistar network. SIM cards are available for purchase at local newsstands, but activating them requires an Argentine identity card, which stops some of the terminators. Therefore, we recommend to ask someone of the local residents about activating the cards for you or find a dealer who sells already activated cards in someone else’s name. The cost of virtual operators' start plan is about $0.5 apiece. Such a cost will have a minimal impact on the terminator’s budget, even in case of frequent blocking of SIM cards. 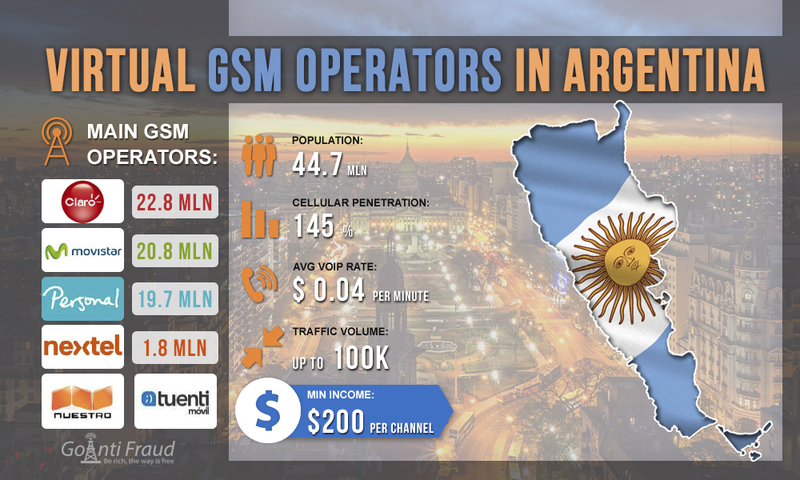 Having involved a large amount of equipment - multichannel openwrt gsm gateway, you will earn at least $200 when working in Argentina.